Your Tax $ , Your Vote! 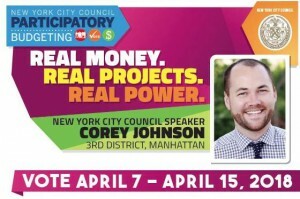 Each year our council member allocates $ 1 million of his capital budget to be spent according to his constituents’ wishes. 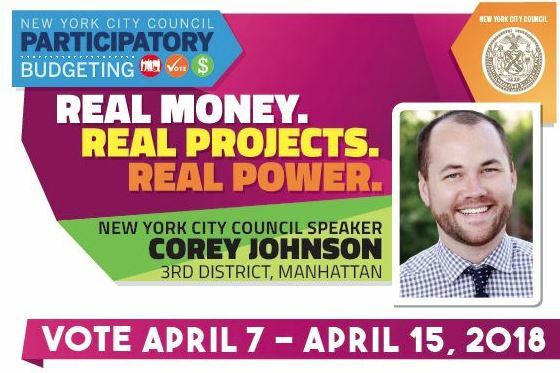 This is called participatory budgeting . 2018 is no exception but you have only one day left to cast your vote. In the last 2 years, 200 trees were installed as part of this process, and this year there is an opportunity to vote for tree guards, which are expensive to procure but critical to keep the trees alive. to see all the projects and to vote! This entry was posted in 9th Avenue Renaissance, Clean Air, Greening, pedestrian, Sidewalk and tagged pedestrian. Bookmark the permalink.